Koons Steel, Inc. is a top performing, structurals-focused steel service center with annual sales of approximately $40 million. Serving the Philadelphia area since 1935, Koons Steel’s products include structural beams, angles, channels, plate, tubing, galvanized steel shapes, grating, expanded metal, cold finished bars and selected aluminum products. The company also performs a wide variety of value-added services including bending & forming, flame cutting, saw cutting, shearing, drilling, punching, tee splitting, and welding. Facing a rapidly consolidating steel service center industry, the Koons family engaged Ameridan to perform a business valuation, analyze the company’s strategic options and execute their chosen course of action. Ameridan performed a market-based valuation of the company and then began orchestrating a multi-dimensional sale process aimed at maximizing the value of Koons Steel. 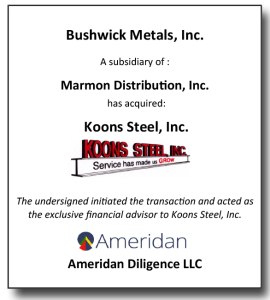 The engagement was successfully completed when Koons Steel was acquired by Bushwick Metals, a distributor of carbon and stainless steel structurals, plate, sheet, bars, tubular steel, decking and specialty products. The company is a subsidiary of Marmon/Keystone Corporation, a leading wholesale distributor of carbon, stainless steel and aluminum tubular and bar products, with corporate headquarters in Butler, Pennsylvania. Marmon/Keystone and affiliated companies are members of The Marmon Group, an international association of more than 125 business units, owned by Bershire Hathaway, Inc. Provider of flat roll steel storage, tranloading and JIT services. Manufacturer of switch stands, signaling equipment, rail gear, and other rail related products.